E-Paper is based on the Microcapsule Electrophoretic Display technology. The E-Paper sheet is a type of polymer based material, which consists of a transparent conductive polymer sheet which works as a front electrode, and millions of microcapsules coated on the sheet. 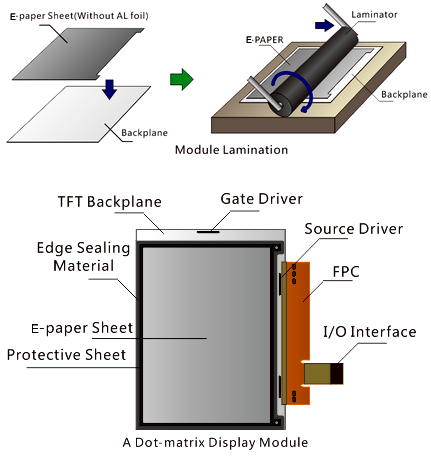 For an E-Paper display, the E-Paper sheet is laminated on a substrate which works as a rear electrode. For more Two Pigment Ink product details, you can click here for learning more. We can also offers a 3-pigment ink system in a microcup structure. This ink was engineered specifically for Electronic Shelf Labels (ESL). It works similarly to the dual pigment system, in that a charge is applied to the pigments, and to a top and bottom electrode to facilitate movement. However, instead of the use of microcapsules, this system utilizes Microcups, which are filled with the liquid and sealed. For more Three Pigment Ink product details, you can click here for learning more. Usually the rear electrode is divided into segments or pixels, and the voltage on each segment or pixel can be controlled independently, allowing various image being formed on the display. Even if the voltage across the two electrodes is removed, the particles will still remain relatively still at current locations. This allows E-Paper displaying a static image without any power consumption, and enables the low power consumption feature. The backplane works as a rear electrode of the E-paper display which control each pixel or segment to formulates the image on the E-paper. Several types of backplanes are available for different applications. For dot-matrix displays, we have TFT glass substrate; For segmented displays, we can choose PCB and FPC. The driver IC generates appropriate voltage to control each pixel or segment of the backplane. The protective sheet iscovered closely on top of the E-paper sheet to prevent damage on the E-paper by moisture. The edge-sealing material fills in the gap between the edge of protective sheet and the backplane to prevent moisture penetrating through the edge of protective sheet. E-Paper are easily readable even in direct sunlight because E-Paper displays reflect light like ordinary paper. An E-paper display has the appearance of ordinary ink on paper, for it reflects light like ordinary paper. Unlike conventional LCD displays, which emit lights, the E-paper display is highly readable, not only indoors but also in direct sunlight, and the image on it is clear and modest, without flickering, and the viewing angle is near 180°. Therefore, It's very suitable for reading. Compared to a traditional LCD display (LEFT) , the E-paper display(RIGHT) is easily readable in sunlight. The E-paper display has higher contrast ratio, reflectance and viewing angle than TN LCDs. E-Paper displays are rugged... meaning they are flexible, lightweight, durable and reliable. Compared to LCD displays, the E-paper displays have obvious advantage in thickness and weight, and due to the polymer film based structure, it's flexible in shape and size. What's more, E-paper is durable and reliable. The flexibility feature of E-paper enables its various application, even for some extreme requirements that other types of display technology cannot meet. Based on the ultra-thin and flexible feature, the E-paper can be used on the smart card as a display showing balance and transaction record information. If we could replace all paper newspapers with eNewspapers tomorrow, it would save 95 million trees which could remove 98 million tons of greenhouse gas each year. The E-paper display is energy efficient due to two advantages it has.Firstly, it doesn't use a back light which consume most power,but rather, it mimics the picture by reflecting ambient light. Secondly, it's bi-stable, which means no power is needed to hold a static picture. This makes the E-paper display consume much less power than conventional displays, such as LCD displays. We know that less power consumption means longer lasting battery life. Therefore, E-paper displays are highly suitable for the products which are limited to the size or require extreme battery condition. The power consumption of E-paper is so low that it can be powered by a solar cell battery.